Crayon Shavings contains a rainbow assortment of micro bar glitters in a clear base. Shown is 1 coat over 2 coats of Sephora Yellow Umbrella with an accent nail of 3 coats over bare nail. This polish is so much fun and takes me straight back to coloring days! :P Formula was great; easy to work with, dried quickly and no need to fish for any glitter. Flamingo Farts is a mixture of bright blue, fuchsia and light pink micro bar glitters. Here is 1 coat over 2 coats Sephora Jungle Playground and an accent nail of 3 coats alone. Stroke the Furry Wall contains yellow, pink, red, blue, and green mirco bar glitter in a clear base. For these photos I used 1 coat over 2 coats of Illamasqua Serenity and an accent nail of 3 coats alone of Stroke the Furry Wall. 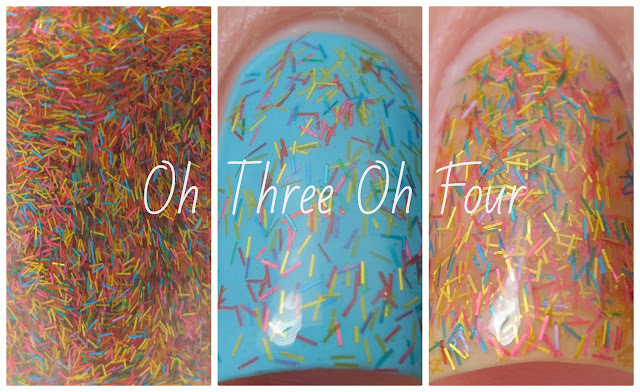 Tookie Tookie has a clear base with green, blue and yellow micro bar glitter. Shown is 1 coat over 2 coats of Sephora Psychedelic and an accent nail of 3 coats of Tookie Tookie. 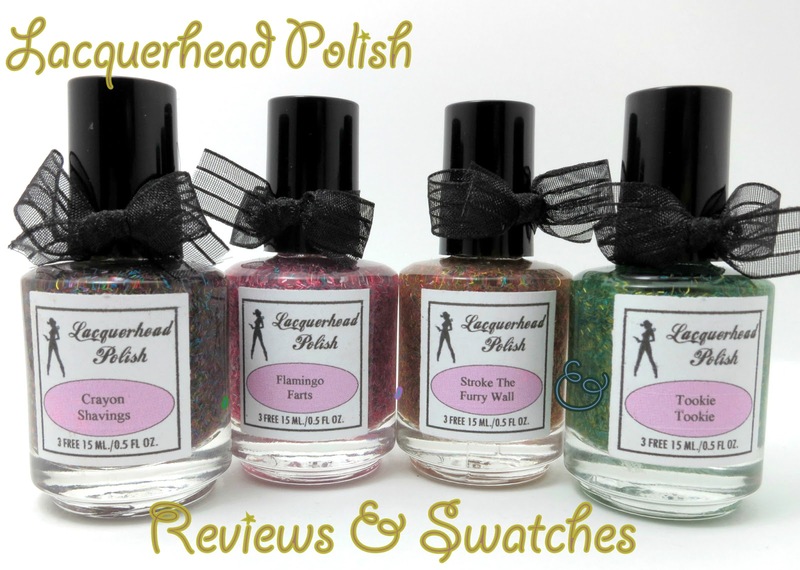 Purchase Lacquerhead Polish through on Etsy. Currently all of these polishes are in stock, plus a ton of other new colors! Make sure to follow Lacquerhead Polish on Facebook and Twitter!